After extensive discussions and over a week of debates, the Karen National Union finally has a new charter setting out its governing principles and administration. 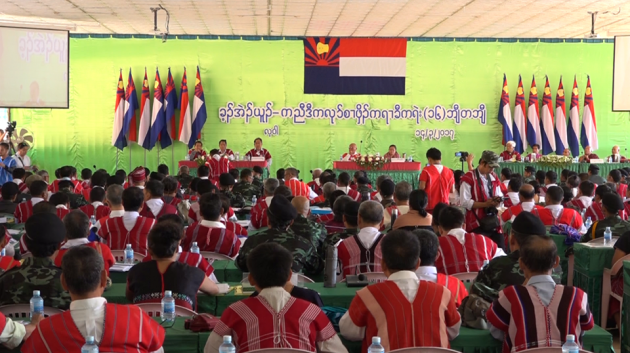 The KNU, one of the major ethnic armed groups to have signed the nationwide ceasefire agreement (NCA) in 2015, is holding its 16th national congress in Lay Wah (also known as Law Khee Lar) in Pa-an District, Karen State. In addition to a new, four-year roadmap, the congress is expected to hold elections for a new leadership body, with both the vice chair and current chair in contention for the top post. On March 30, the congress announced that after thorough review, they approved the new charter, according to Padoh Saw Thaw Thi Bwe, chair of the KNU congress convening committee. “It was a long discussion about the constitution and the rules. But in the end, there were only a few amendments,” he said. He added that the lengthy debate was caused in part because of confusions, and in part because of difficulty between translating [between] Karen and Burmese languages. “But after all that, it was finally approved,” he said. In addition to outlining the KNU’s basic principles and department hierarchy, two new committees on land and human rights were added. The congress also voted to increase the number of women involved in all administrative and government levels, as well as in the central committee. The 16th KNU congress began on March 14.